With this option, you can insert the one or more titles for the columns in the applications, allowing to modify its size, color, font and position. If you have fields with a dynamic display, the Group Label won’t work. Title Allows to define a title that’ll be displayed in your Group Label. Font Allows to define the group label title’s font. Font Size Defines the font size for the group label title. 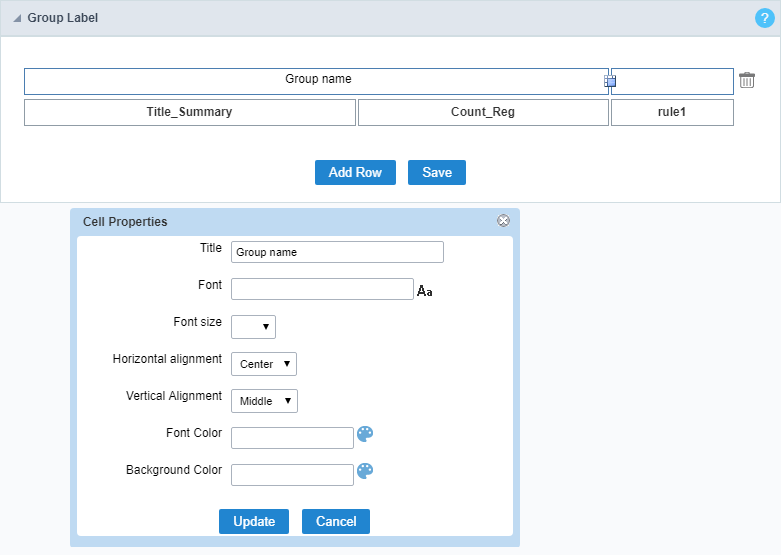 Horizontal Alignment Allows to define the horizontal alignment of the group label title. Being Left, Center or Right. Vertical Alignment Allows to define the vertical alignment of the group label title. Being Middle, Bottom or Top. Font Color Allows to define the font color for the group label title. Background Color Allows to define to color of the background for the group label title.